For parents of pre-school and early elementary children, the Looney Tunes Phonics iPhone and iPad app delivers curriculum to develop word and sound recognition skills critical to successful reading and verbal skills. The Looney Tunes iPhone and iPad app makes it fun for kids, and the reasonable price tag makes it accessible to families. The Looney Tunes Phonics iPad app incorporates Looney Tunes cartoons into education sessions. The cartoons have wit and sass to entertain a parent, as well as the silly antics required to entertain your kids. The cartoons are generally the interludes where your child has a break from the learning process. Your child will quickly return to the interactive phonics instruction, so this seamless cycle of entertainment and learning keeps you from hovering over your child to constantly click next. The instruction aspect to the Looney Tunes Phonics iPad app is beautifully produced and perfectly tailored to engage and teach your child. A friendly robot leads the presentation of curriculum on a fun blackboard constructed from graphic elements of the cartoon. One example is the blackboard floating with the help of blow dryers inflating parachutes. The instruction incorporates touches on the screen, as well as touches on a fun keyboard. This is a neat touch, as kids are learning to type at the same time as reading. Depending on the amount of time you have to devote to the instruction, you can select from full, medium, or short lessons. The instruction starts from simple concepts like sounds, then logically moves and expands to words and sentences. The curriculum also includes repetition to reinforce the lessons, but not so much repetition to make it boring. 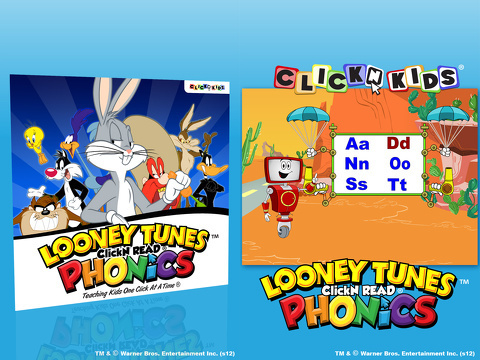 The Looney Tunes Phonics iPhone and iPad app is a free universal download, but an account at looneytunesphonics.com is required to access the functionality. For $29.95 per year, you can customize learning experiences for up to 10 kids. That is an extremely reasonable cost when you consider the content is accessible on an iPhone, iPad, and online as well. 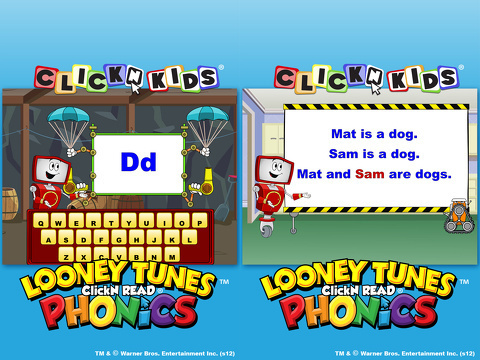 Looney Tunes Phonics is a fun, engaging educational iPhone and iPad app to keep your child stimulated at home, riding around in the grocery cart, and delivering a sibling to gymnastics. AppSafari review of Looney Tunes Phonics was written by Jenni Ward on November 16th, 2012 and categorized under App Store, Education, Games, iPad apps, Kids, Kids, Universal. Page viewed 4524 times, 2 so far today. Need help on using these apps? Please read the Help Page.